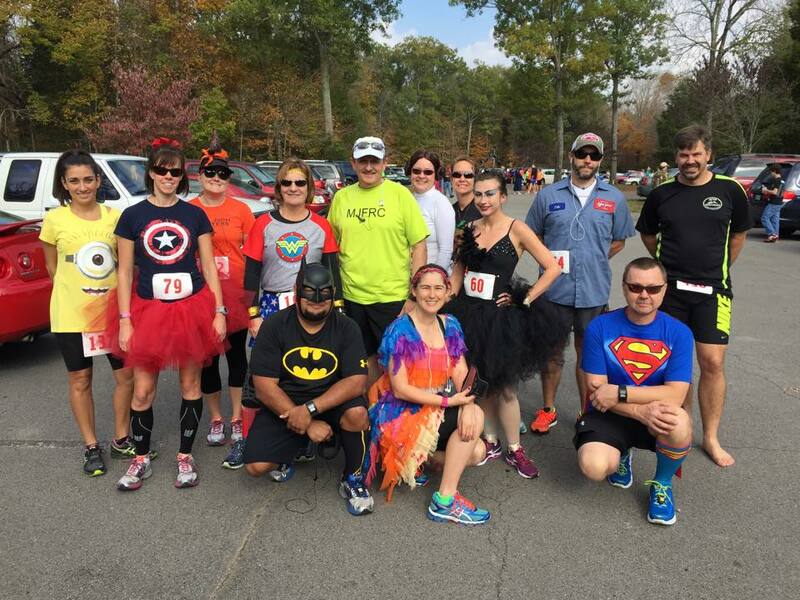 This race was basically an excuse to wear an old Halloween costume. It was only $8 to run it, and it was along one of my favorite running paths, so why not? 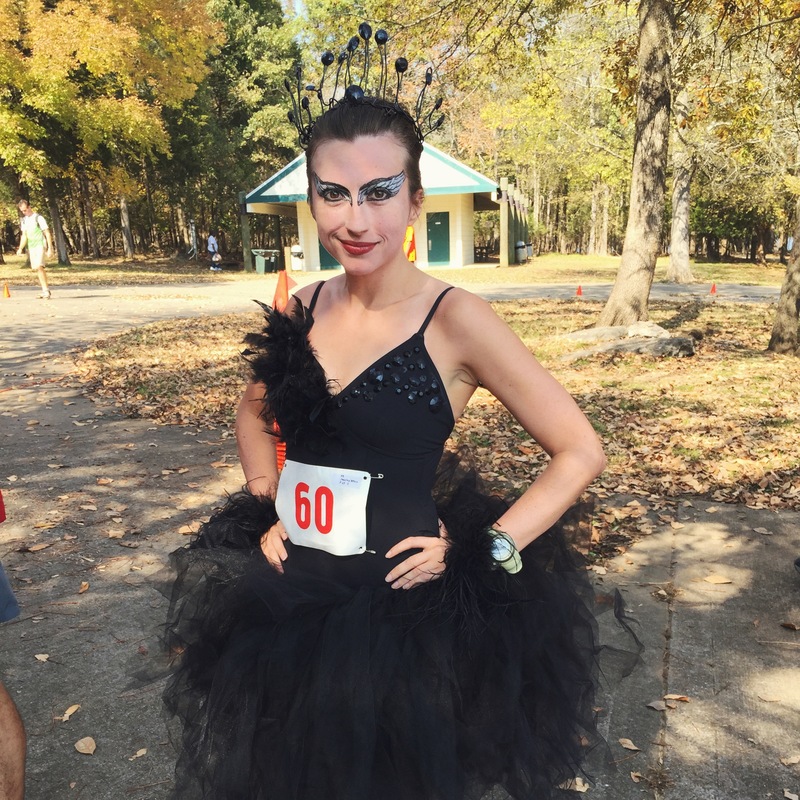 I debated between two running-friendly costumes. 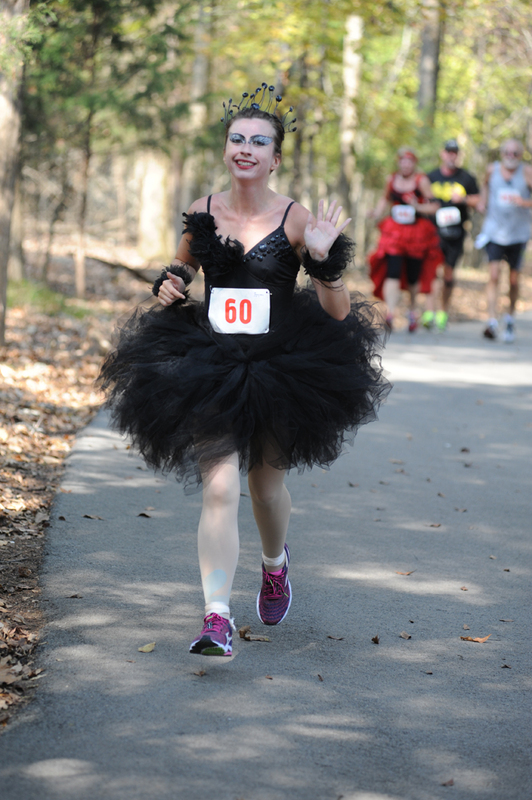 2013’s Velma (if it was cold out) or 2011’s Black Swan (if it was warm). Honestly, I was really hoping I could do Black Swan, as that one is way more fun. As the time for the race got closer, it appeared that it would be in the 60s-70s. Yay! Obviously, I didn’t wear pointe shoes to run in (that’s nightmare fuel), but I laced ribbon through my running shoes and tied it around my ankle to mimic them. I bobby-pinned my hair and the tiara to death, but I was still sure it was going to fall off while running. Luckily, the rest of the costume was not an issue. I guess one plus of having a ballerina-sized chest is that a backless leotard works just as well as a sports bra, haha. I wasn’t planning on really racing this, so I didn’t have any time goals. The costume contest was my real goal. The race wasn’t until 11 am, so I had a leisurely morning in bed before finally pulling myself up around 8:30 to start work on my hair and makeup. I meant to drink some water when I got up, but I forgot, so I went into the race with a completely empty stomach. I arrived, parked, and got my bib. After pinning it to my leotard, I joined the group of Mt. Juliet Flyers who were running the race for a group photo. The start line wasn’t marked, so we just headed in the direction of where we thought the start line was supposed to be. There was no timing mat at the start, so the official times must all be from gun time, since my watch (which I started as we passed the orange cone that I figured was the start) was about five seconds less than the official time. This is the only mile I ran straight through without a walk break, so it was my fastest. We started on an out and back section down a park road before ending up on the 2ish mile loop around the lake that we would run twice. I took a walk break about 1.25 miles in. I could definitely feel the fatigue in my legs from my running streak. I was also really wanting some water, but I had passed the water station at about 0.75 miles in and wouldn’t see it again till the end of the third mile. At some point on this mile, I realized that my car keys, which I had stuck in the bodice of my leotard, were not where I had put them. It took me some time to figure out that they had fallen all the way down to the bottom of my leotard. Yes, I had keys in my crotch. They weren’t really bothering me, so I just left them there. Right as I was completing the first loop of the lake trail, the winner came zooming past me into the finish. Yes, I was lapped! He was so freaking fast. I finally got some water. Refreshed from my water break, I picked up the pace a little. I don’t have much to say about this mile, other than the fatigue in my legs was getting heavier and I started counting down until the end of the race. My watch actually says that the race was 4.84 miles. Most people I spoke to said theirs came in around 4.95, so I don’t know if the course was short or what. It doesn’t really matter to me, since I wasn’t running this for a PR. I was just happy to finish in under an hour! Everything in the costume held up nicely! Props to the bobby pins and waterproof makeup!